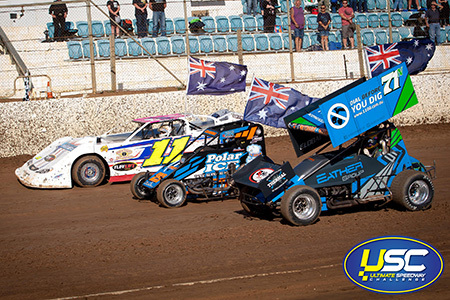 Last Saturday night saw one of the best overall events ever staged at the Murray Machining and Sheds Murray Bridge Speedway with round 3 of the Hi-Tec Oils Ultimate Speedway Challenge. With high quality fields in all three divisions the racing on track was intense and at the end of the night it was an interstate sweep of the main events. Max Johnston was outstanding as he won his first career Sprintcar main event, Adam Clarke secured his second Challenge round with victory in the Speedcars while Robbie Farr created history as he won yet another main event, this time in a Late Model. Australian Champion Kaidon Brown would finish third with Andy Pearce just edging out Bishop on the line. Brett Ireland, who secured a last-minute ride in the Crouch #7, would fade to sixth with Rory Jackermis the only other finisher in a race that saw as many cars end the race on the infield as on the track. Speedcar heat winners were Brown, Glen Arnold, Ireland and Clarke. The Sprintcar feature, that doubled as Round 2 of the Shadetec USC SA, was full of incidents and as a result it was shortened to 20 laps. Following his pole shuffle win local Ryan Jones started on the pole alongside Jessie Attard but it was Sam Walsh who shot into the lead from the second row on the initial start only to have the red lights come on as Brendan Quinn rolled after contact with Matt Egel on the start. Once the race got back underway the reds would be on again as the field went through turn three as Ricky Maiolo rode out a heavy crash which saw his #24 machine dangling from the catch fence. After a brutal start the race finally settled down with Attard leading the opening 8 laps before Jones got by with Michael Stewart, Max Johnston, Brad Keller and Aidan Hall all fighting for the minor placings. With only four laps remaining Jones looked set for victory until he tangled with the lapped car of Adrian Cottrell with both cars spinning in turn four. With the leader being tightly packed the incident would take out four of the top five drivers with Johnston sneaking through to take the lead once the race restated. For that point Johnston led home opening round winner Luke Dillon, Matt Egel, who had driven from the back of the field after stopping under yellow to adjust his safety equipment, Daniel Pestka and Robbie Farr. Keke Falland finished sixth while New Zealander Brett Sullivan, Aidan Hall, Hayden Pitt and Lisa Walker completed the top 10. Jessie Attard, Brad Keller and Ryan Jones would round out the finishers. Michael Stewart, Brad Keller, Ryan Jones, Aidan Hall, Steven Caruso and Max Johnston were the heat winners. The Late Model feature would see history as Robbie Farr added yet another Main event to his immense resume as he was an all the way winner in the 20-lap finale. Darryl Grimson made a late charge to finish second ahead of an impressive Brendan Hucker, who was having his first outing in a Late Model at MMS. Victorian veteran Gary Bryans was next ahead of local Ryan Alexander, who bounced back well in the final after a disappointing qualifying effort. Unfortunately, the race saw several retirements including former Australian Champion Callum Harper who was running second and making an impressive run on the top groove before his right rear tyre exploded with seven laps remaining. Heat winners were Robbie Farr, Darryl Grimson, Callum Harper and Mat Crimmins.